I´m addicted to coffee! Every country we visit we search for a good and strong coffee. In Thailand wasn´t different, between all the places we visited in the country, we tried to squeeze a cup of local coffee. But to be honest, we weren’t fully satisfied, until a month ago. We went out of the beaten path in north of Thailand to experience one of the best coffees we have ever drank, and discovered unique things to do in Chiang Mai. We left Chiang Mai city at 8 am. The van took us to the Doi Inthanon National Park, a mountain range that comes all the way from the Himalaya and covers an area of 482 square kilometers, the tallest peak is at 2,565 meters above sea level. Bottom line, It´s a big park, with huge hills and even bigger beauty! Took us approximately one hour to reach the park entrance, then more 30 minutes to arrive at our first stop, a tiny village surrounded by mountains and coffee trees. The mountain village is the home of a Karen Tribe, an ethnic group that migrated from Myanmar to Thailand, since the 18th century they try to keep alive most of their ancestral traditions. We were welcomed by Yosae, the father, Mot the son, and Poche, the matriarch of the family also the shyest one in the house. The smell of the coffee was the spark I needed to ignite my addiction. Robusta and Arabica beans that have been hand-picked, cleaned, dried and now would be roasted by me. It’s not everyday that you can have this amazing coffee experience. Produce and drink your own coffee. Oh yeah, I was happy like a child. We did the process manually, the same way the family has been producing coffee for the past 30 years. I stirred the white beans until they turned black. The smell filled up the air, a mix of smoke, bitter coffee and happiness. After 20 minutes roasting the beans on the wooden fire, Yosae came to check my work, and he decided that was time to stop the process and have a close look to the coffee. He put the beans in a wooden strainer and swung them in the air. The aroma jumped into our faces, with his experienced hands he picked one of the beans, looked it carefully, chewed it for a while and then told me in a broken English: Not bad! Very good! Those were the words I was waiting for. First task nailed! Now let’s grind the coffee and boil some water. Next step would be a good chat and coffee sipping! While we drink my coffee [that was delicious, strong and full of flavour], Yosae and our guide explained that the coffee plantation on this area dates back to 1979. Thailand´s King introduced the coffee trees in the Chiang Mai mountains to replace the opium crops that were cultivated by the Karen tribe. Trees were planted, people in the village were trained and today Yosae family produces 3 tons of organic coffee per year. One-third of it goes to the Royal Project, and the other 2 parts are sold to local market and exported. The coffee changed their lives, and also mine. 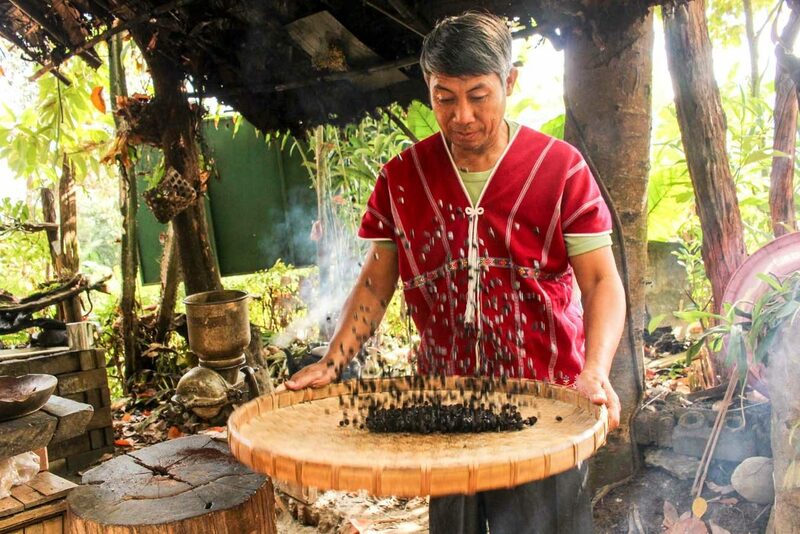 I never imagined how one of the most traditional beverages in the world could be so incredibly tasty, and in a such small production scale could help people to live better. As well as promote responsible tourism. The village was tiny, not touristy at all, with simple houses, live stock, fruit trees and coffee. Among all the Thailand tours we did, this one was full of surprises. First was the possibility to make our own coffee. 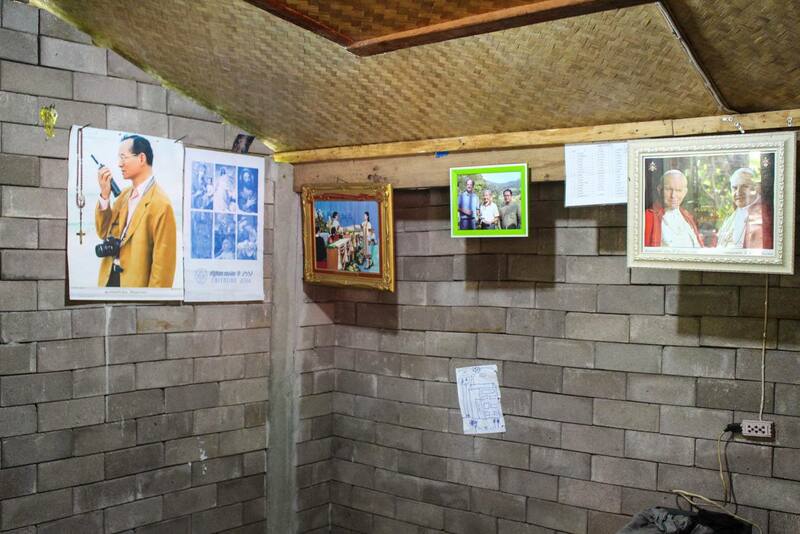 Second, we saw on the same wall a picture of Thailand’s King side by side with the Pope [I end up learning that Karen tribes were converted to Christianity by missionaries]. The third and the most surprising one, we got high on coffee! I consider myself a coffee addicted, and I thought I have already tried some good and strong coffee [including the Kopi Luwak, from the poop of the civet]. I was wrong! After 30 minutes I was high on caffeine, a mix of energy and happiness. We got an injection of vitality, everything we need to our next adventure! We bought a pack of coffee to take home and waved goodbye to Yosae and Poche. 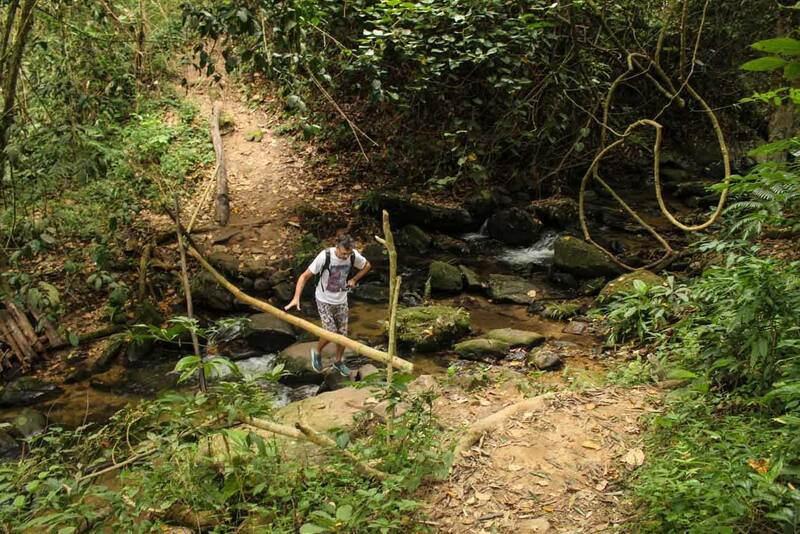 It was time to start our trekking in the woods and conquer the hills of Doi Inthanon. 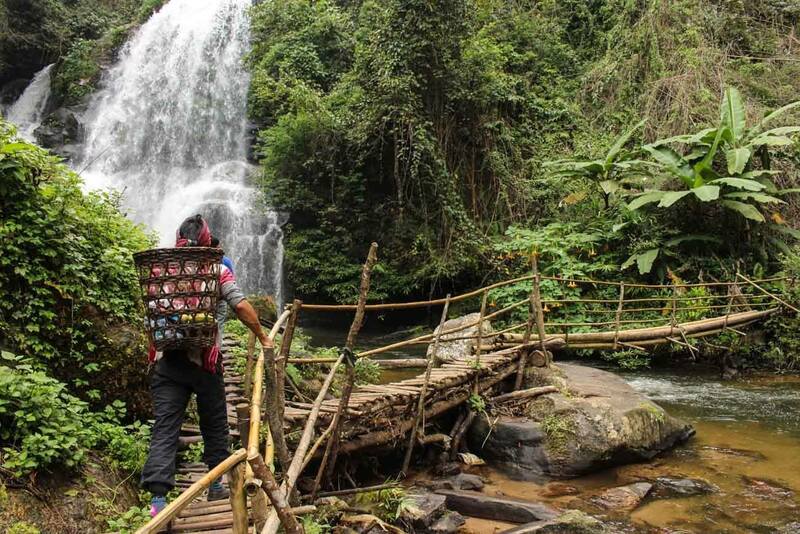 Mot was our local guide, we followed him through rice fields, dense forest, freshwater rivers and waterfalls. The expedition to the Chiang Mai mountains was more than we expected. I know the region is famous for waterfalls and trekking trails, but I thought it would be too touristy. Thanks God I was wrong again! Mot lead us by an empty trail, hill up, hill down, and at least three stunning waterfalls on the way. The water was too cold for swim, but refreshingly good for a sip. It was a two hours trekking, not too hard. We are runners, so for us was a fun walk, some people might take more time to finish it. But believe me, totally worth, all the sweet and energy we spent was rewarded with stunning landscape. Not even talking about Mot´s tricks on how to make whistles from rice leaves, spoons from bamboo, hanging on the trees, and the passion fruit he served to us during one of the strategic breaks. Our Chiang Mai trekking trail finished on the top of the hill, where the car was waiting for us. One more goodbye and we followed our tour schedule. Mot stayed where he belongs, in the middle of the nature, in his family’s garden, “the hills of Doi Inthanon”. In the park there is a huge tourist center, with restaurants, toilets, gardens and parking lot. We had some local food, Rob’s favorite soup “Tom Kha Gai” and fried fish. Although the restaurant were full of locals, the food was perfectly cooked for a foreigner, no spice whatsoever. We had to ask for some extra chili to spice up our soup. Batteries recharged, back to the road. We drove for a few minutes to reach the Royal Project at Khun Klang Village, where the Hmong hill tribe produces fruits and flowers. The project here has the same purpose as at the Karen village, changes the opium crops for modern agricultural practices. Colored flowers, orchids, a lake with swans and many tourists. Our tour to the Royal Project was quick because we had another stunning place to visit before the sunset. As people say, time flies when we are having fun. 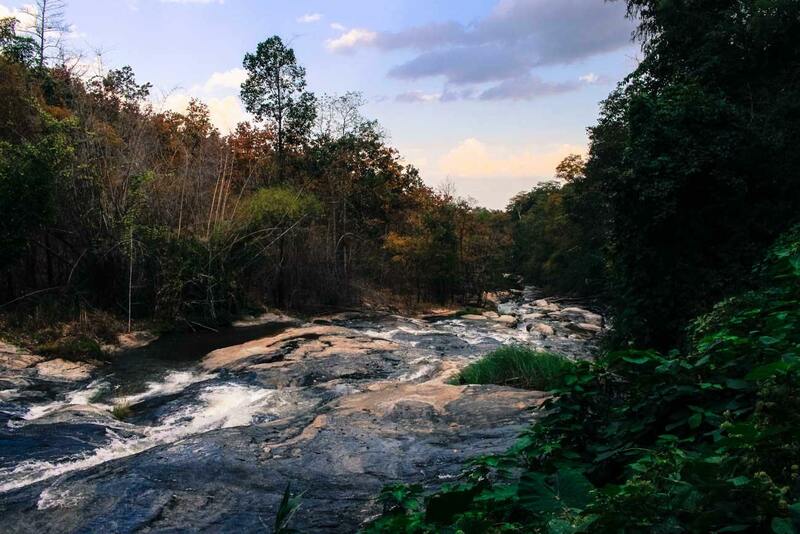 The driver took us by rice fields, forests, a few houses and some empty roads… Almost one hour driving and we arrived at the famous Mae Ya Waterfall. The trip back home took almost 2 hours. That was fine, after the trekking, the flowers, the waterfalls and the coffee experience we deserved a nap. Thanks to our guide and driver that understood it! 🙂 We boarded on the tour Essence of Chiang Mai looking for a good day in the middle of nature, and end up learning about local culture, sustainable tourism, organic coffee, nature and unique things to do in Chiang Mai. That was awesome! The tour we did was organized by Buffalo Tours, a well-known and trustworthy company that operates tours around Thailand and Southeast Asia. This was the first Thailand tour we did with them and now we are excited to have more unique experiences. If you search online, you will find plenty of information about things to do in Chiang Mai. 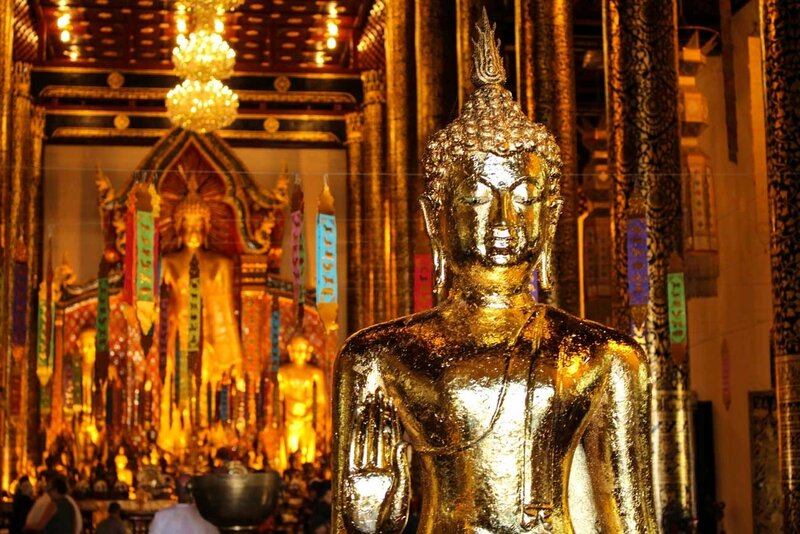 The city is famous for the beautiful temples, the city gates, massage courses and Buddhist festivals! You must visit all the Chiang Mai top attractions, but don’t forget to have some unique experiences too. On our day tour we breathed fresh air, drank strong coffee, tasted tropical fruits, and gazed stunning landscape. That is what travel means to us! 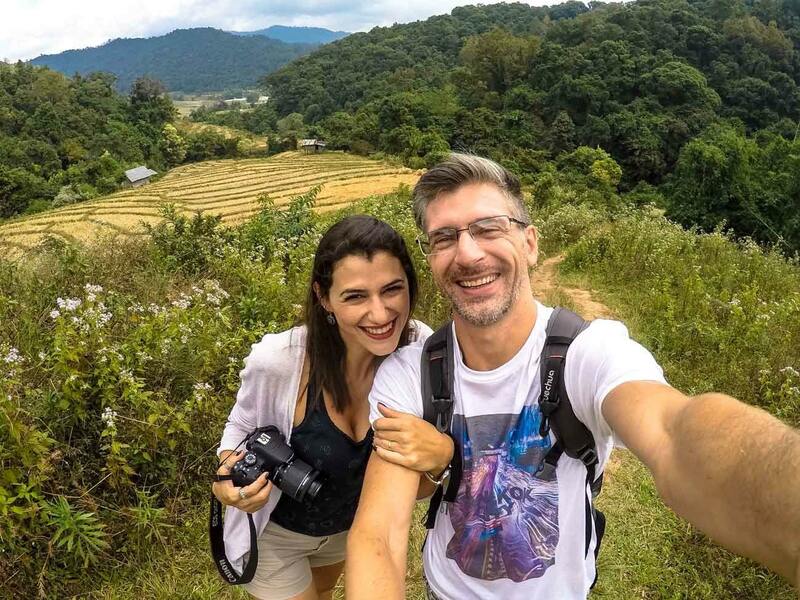 Chiang Mai is also worldwide famous as the mecca of digital nomads and travel bloggers. It´s our address every time we need to stop and focus on work. You can find all the details about the digital nomad scene, how the expats live in Chiang Mai and how they perceive the city on a special post we published: Why Chiang Mai, The Home of Expats & Digital Nomads. Hope our post about unique things to do in Chiang Mai have inspired you to visit the city! Keep in mind that Thailand has much more to offer than only beaches and tropical island [like Phuket, that is underrated by the tourists but we love it]. 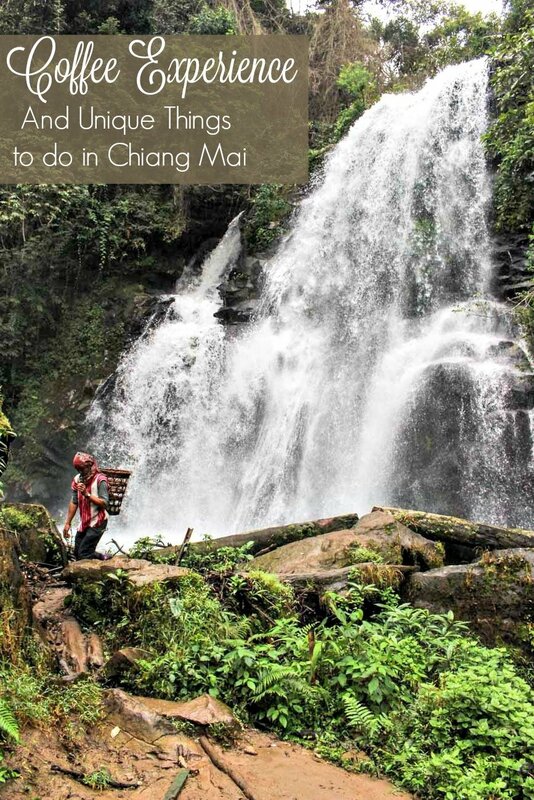 So now that you know some amazing things to do in Chiang Mai, let´s go to the practical stuff! How to get to Chiang Mai?? Chiang Mai is located in north of Thailand, it´s one of the biggest city in the country, very famous among local and international tourists. 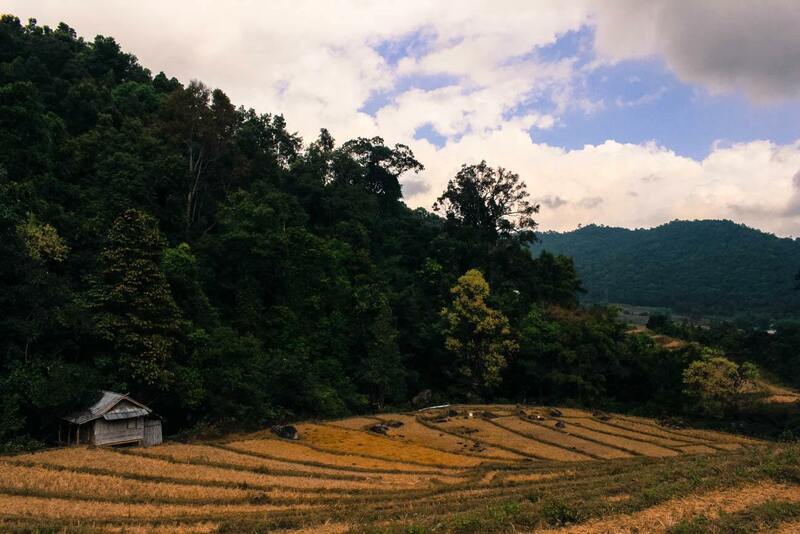 There are plenty of ways to get to Chiang Mai, and we already tried them all. From Bangkok to Chiang Mai you can take the bus or the train [both run day and night, and are the cheapest option]. By bus, we used the government company: fair price, spacious seats and meals included. For timetable check the official website. 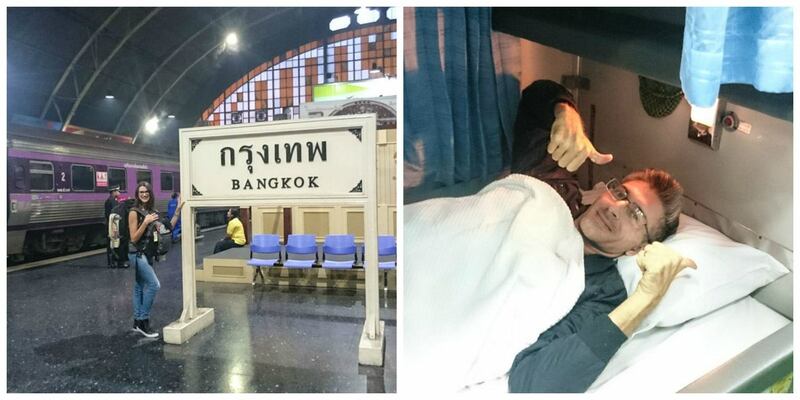 On our last journey from Bangkok to Chiang Mai was by night train and it was great fun! The bed was big, comfy and train rides smoothly. If you are in Ayutthaya, you can also get to Chiang Mai by train. Prices and timetables here. Chiang Mai Airport is international and receives daily flights from Bangkok, Phuket and other major cities in Southeast Asia. You can find some good flight deals on Skyscanner, especially with Airasia. Where to stay in Chiang Mai?? Chiang Mai has a huge offer of accommodation. From hostels in the old town, to resorts surrounded by rice fields, you can choose a hotel in Chiang Mai that suits your budget, style of travelling and location. The old town is full of guesthouses and hostels. Most of the backpackers choose to stay inside the city walls due to the big offer of shared rooms, cozy and clean guesthouses. There are plenty of things to do in Chiang Mai old town and is very easy to find affordable food there. But don’t be a fool, around the tiny alleys and shiny temples you will find some small and luxury hotels too, beautiful buildings with traditional Thai hospitality. This is a trendy neighborhood, full of bars, restaurants, local designers shops and expats. The number of boutique hostel and hotels in Nimman is increasing every year. It is our favorite place to stay, and you never get tired of it, every night we spot a new bar or a food stall serving local & international food! 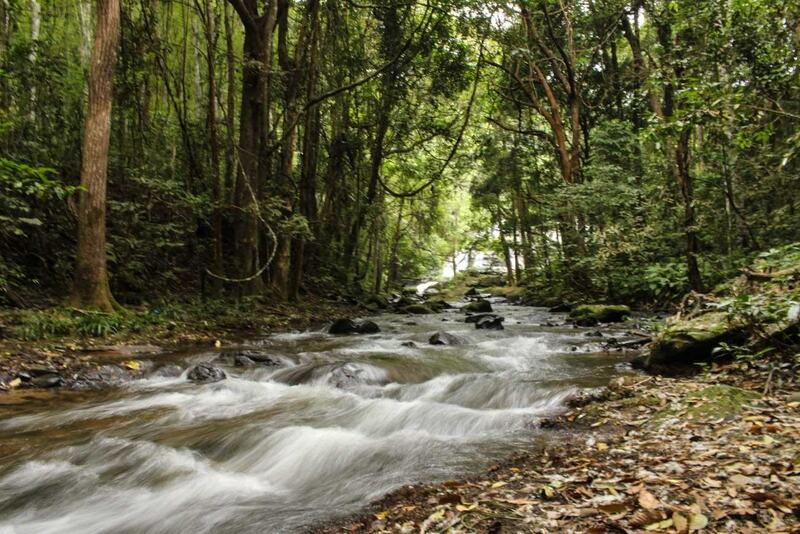 Chiang Mai is big and the nature is the city’s best asset. Many hotels are nestled in the mountains offering stunning views, luxury spa treatments, and services that will take you beyond relaxation. Or maybe you fancy to stay in a hotel in the middle of the rice fields, don´t worry Chiang Mai has it too. We stayed a couple of days at Panviman Chiang Mai and we loved it! The resort is located in the mountains near Chiang Mai, surrounded by green and fresh air. The staff will spoil you with Thai hospitality and you can enjoy many activities or just relax. Doesn’t matter where you decided to stay, it´s quite easy to get around Chiang Mai. Tuk-Tuks and Songthaew [the red local bus] run around the city all the time, you can also rent a motorbike or a bicycle to explore the city on your peace. How is the weather In Chiang Mai?! From November to January the weather is cooler, not a proper winter, but you might need a jacket at night-time. Is our favorite season to visit the city and explore the things to do in Chiang Mai. A fresh break from the hot Bangkok or the island’s humidity. March to June is the hot season in Chiang Mai. And March is the worst time ever to visit the city. From the end of February to end of March is the famous smoke season, the air is horrible to breathe, you can’t see anything and everybody wear masks. 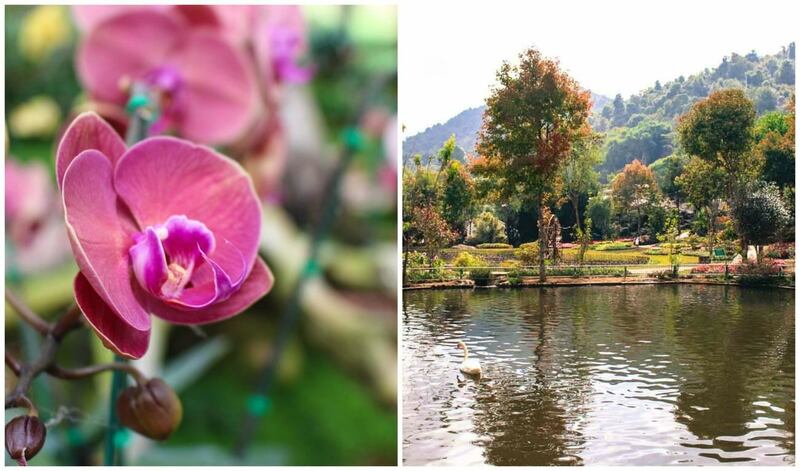 Come in the best season and let Chiang Mai surprises you too! Remember my words: Go and visit all the attraction, all traditional things to do in Chiang Mai, but also go out of the beaten path, explore the uniqueness and the beauty of this region. And of course, drink coffee, at least two, one for you and one for me! Cheers! Like it? Pin it for later!! Have you roasted and ground your own coffee? Have you find any other unique things to in Chiang Mai? Leave your thoughts, plans and your suggestion for amazing coffee! PS: Thanks Buffalo Tours for helping us to discover amazing things to do in Chiang Mai. Despite who paid the bill, you always receive our sincere opinion. Also, some of the links on this post are affiliated, what means if book a hotel through here we earn a commission [no extra cost to you]. Thanks! I can just imagine the amazing flavour in the air while making coffee! I would make me hungry! Well, yes, I’m an Italian coffee addicted and the simple coffee smell makes me hungry! I’m so curious abt the thay one. Where did you have the best coffee ever in your travels? I believe that the espresso we drank in Reggio Emilia was the best one. Full of flavours and STRONG!!!! A coffee tour. 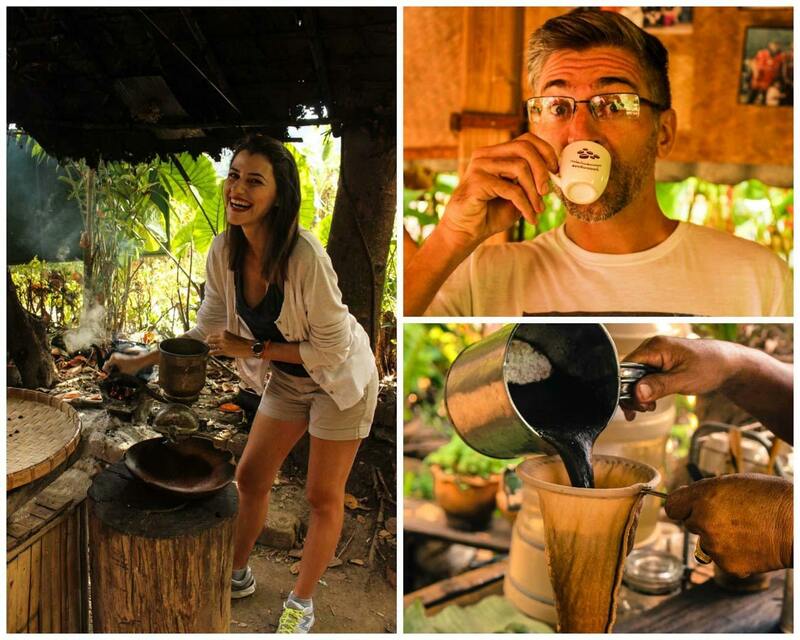 I am addicted to coffee and I can’t even tell you how many coffee tours I have been on! 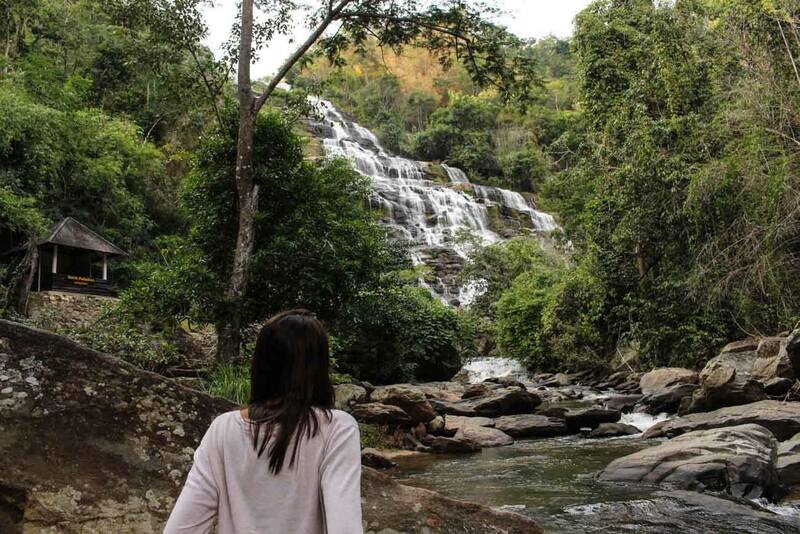 I had no idea it was doable in Chiang Mai – the places you visited are stunning, love the idea of that hike too! Yeah, it was a surprise to us too! Love Chiang Mai even more! Me too! 🙂 what is your favourite recommendation for SE-Asia? It’s hard to say, but we love the combination of beaches and culture in Thailand! Can’t miss that! CM is brilliant, we came last year for a week and stayed a month. I’ve made coffee in cafe’s in my home town, but never in the great outdoors like this, what a cool experience. 🙂 And I swear the coffee tastes even better when you make it. How fun! I’ve always wanted to visit a coffee plantation. I love seeing how things are produced and it’s even more fun that you got to make some yourself! Would love to do this sometime, and the trekking at the end looks gorgeous, too! Looks like a lot of fun! I am now planning a trip for Easter (25-27 March) to Chiang Mai and I am reading that you say that is the worst time to visit….mmmm…is it that bad? 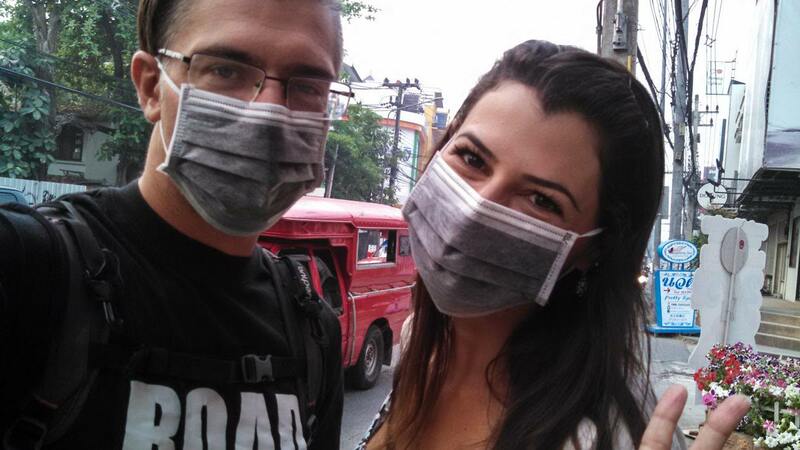 I definitively don’t want to wear a mask, I have enough of that in Singapore during the haze. what is the cause of the smoke? and is it everywhere in the city? You can get some fashion masks! Everything always tastes better if you follow the whole process and make it yourself! I’m a huge coffee addict, so I’m very jealous of your exceptional experience! 🙂 Never knew Chiang Mai to be such a coffee destination! This was a surprise to us too! Just learned that they have several coffee farms around here! 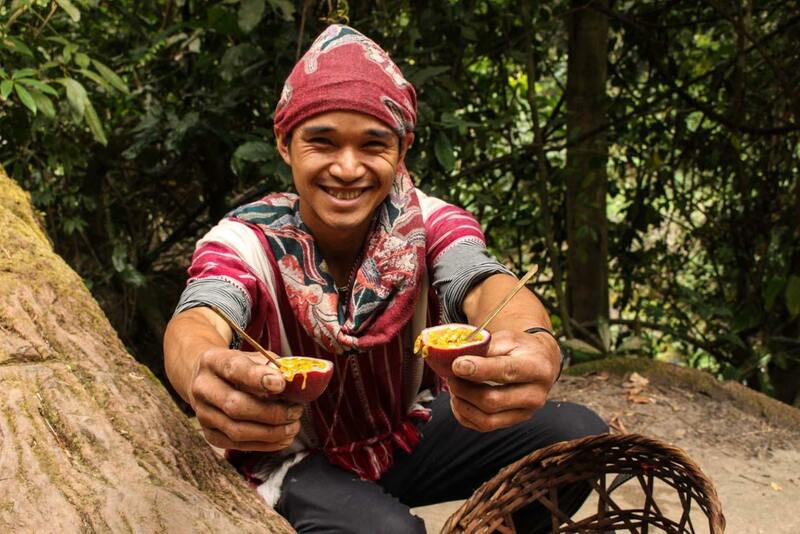 Coffee in Chian Mai? I didn’t know about that! We also have coffee trees in our place yet we don’t usually utilize it and make them into coffees. We use corn instead which is also great tasting too. But anyways, you really did enjoy Chiang Mai! Hopefully to be able to visit this place too. Oh I wish we had discovered this when we were in Chiang Mai. I will just add it to the list of things to do, next time we are in there. Now you have another good reason to come back soon! The coffee experience looks fab! I have heard so many amazing things about why Chiang Mai is such an amazing place for digital nomads. I would love to spend some time there. Must have been really exciting to experience this, oh how I wish I was there. Chiang Mai is a very common name to me and hope to be there sometimes near the end of this year. You guys have really inspired me on something to do over there. Thanks for sharing this. 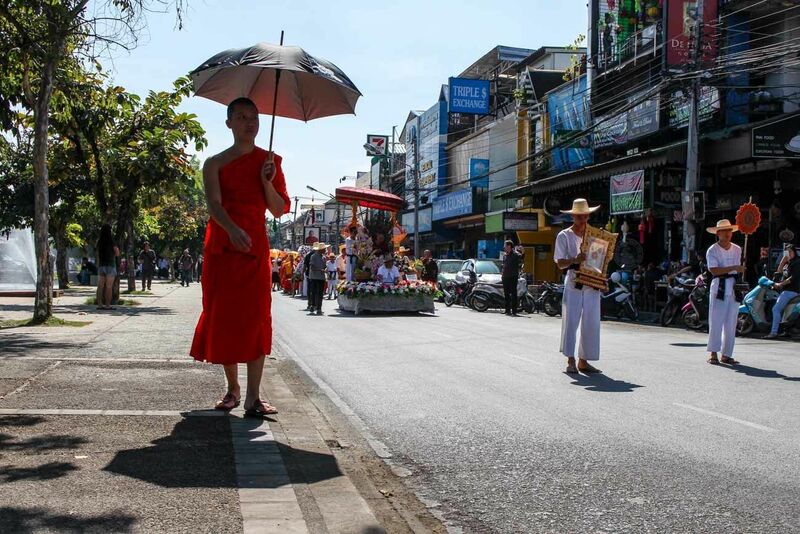 Chiang Mai is a city full of things to do and see, but most of people stay only at the old town visiting the temples. 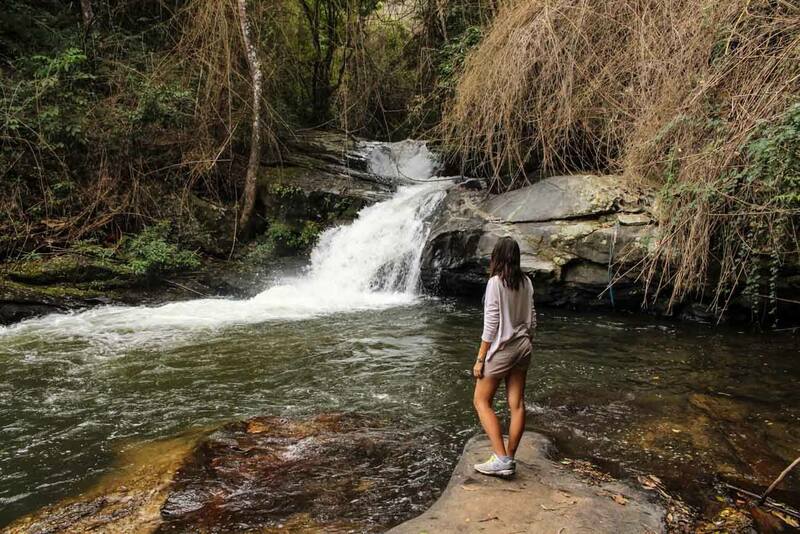 If you come here, venture yourself to around the city and go to the mountains, I´m sure you will love it! I have always wanted to visit the Chiang Mai area of Thailand, but was completely unaware of its coffee history. 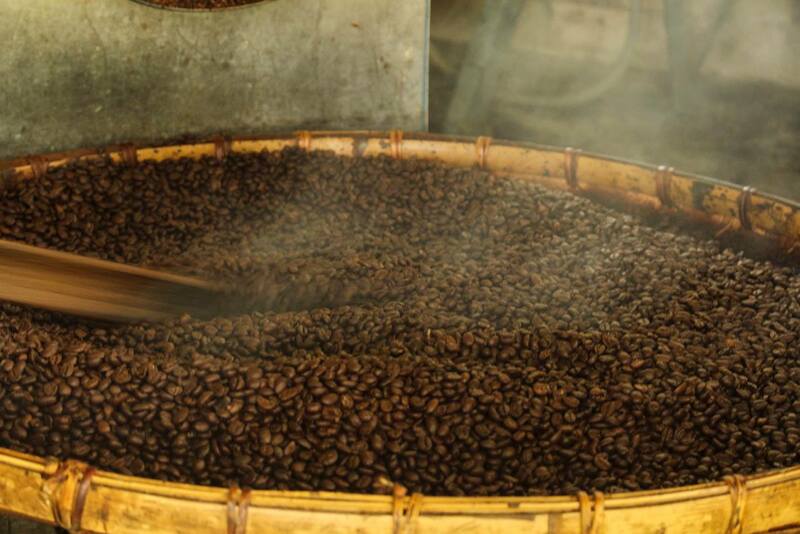 I love visiting coffee farms and speaking with the farmers, I haven’t roasted my own coffee, so that it totally cool! I would definitely add this to my “to-do” list for my trip! The coffee experience in Chiang Mai is very nice, one of the best, and strongest, coffee we have drank in Thailand… The best is that not many people knows about it, so still can visit very local and interesting farms. To be honest, I don’t know the name of the village. We were driven there by our tour guide and we passed by so many small cities and villages that I can’t give you the right name. Although I can assure it is located at Doi Inthanon Natural Park. Most interested in th coffee making and tasting portion of the tour. 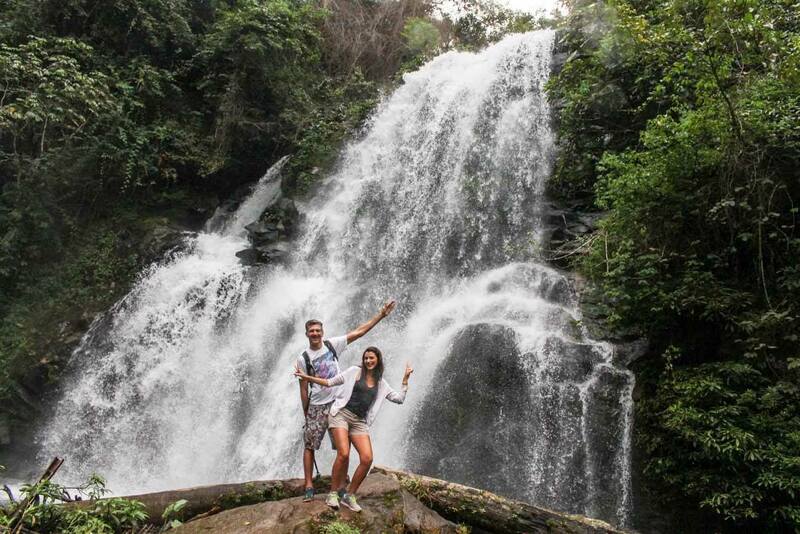 Would you suggest trying to do just that part of the tour, or was the rest (hike and waterfall) definitely worth it? Chiang Mai is one of our fave places. We don masks during the crop burning period. Hopefully the farmers find better methods than the Slash and Burn approach used outside of the city, in the future. From Dec thru Jan though, perfect weather. Clear, 72 during the day, 50’s at night and not a cloud in the sky. Brilliant. Reminds me of fall time weather in my home state of New Jersey. That passion fruit looks delicious. I can taste it from both my Thailand and Bali trips. Cut open. Spoon it out. Or we also tossed the seeds and juice into a blender with some sugar and made shakes. Hummmm, passion fruit shakes are the BEST!! Now you made me miss even more Thailand and Bali!! The photos looks lovely. M intrigued with the trip. Chiang Mai is a great destination for coffee lovers, the plantations are great and the cafes around the city pretty and serving a good coffee. I have no idea, since we were with the guide we didn’t pay attention to the way.